Really? Wow, a statement like that makes the hair on the back of my neck stand up. If a government agency like the Department of Homeland Security or the Bureau of Industry and Security just happens to stop by your office for a visit, you are not going to do yourself any favors by making such a declaration. 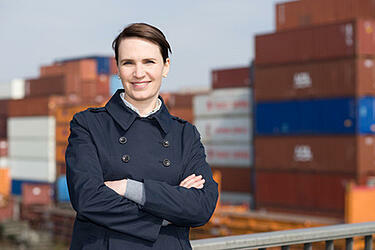 Freight forwarders play an important role in managing the movement of freight worldwide. One may think that a freight forwarder that does everything for an importer and/or exporter is providing you with really great service. In reality, however, the freight forwarder that does everything is really doing you a disservice and, in some cases, may be opening you up to increased compliance risks and exposure to fines and penalties. Strongly reconsider your choice of a forwarder or customs broker if they do not regularly involve you in the imports and/or exports they handle on your behalf. There are some really great freight forwarders and customs brokers out there that want to assist you in your compliance efforts. Assist you; not just do it for you! As an importer you are required by law to use reasonable care when classifying and declaring your imports coming into the United States. As an exporter, you are required by law to perform your due diligence when exporting your products, which includes ensuring that the Electronic Export Information (EEI) is correctly filed through the Automated Export System (AES) as required by law. My mom would always say, “If you are not going to do it right, don’t bother doing it at all.” Same can be said for importing and exporting. If you, as a company, are not going to put the necessary effort and resources into doing it properly, you are much better off not doing it at all. Working with them to properly classify the products you are importing and/or exporting and not relying on them to do it for you. Providing your freight forwarder, customs broker, and/or integrated carrier (in the case of express consignments) with the information they will need to properly file an import entry on your behalf. You then need to audit what they file to ensure it was done accurately, and you must promptly notify them if the entry needs to be corrected. Filing your own EEI, if required, or at the very least providing your forwarder with the information they need to properly file it on your behalf. If you are not filing your EEI yourself, make sure you are requesting and receiving a copy of what was filed in AES on your behalf and auditing the information. If it was not done properly, get it corrected as soon as the error has been identified. Authorized agents are required to provide the U.S. Principle Party in Interest (USPPI) with a copy of the export information filed in a mutually agreed upon format (15 CFR Part 30.3(c)(2)(iv)). If you are not currently receiving this information on any transaction where a freight forwarder was used and you relied on them to file the EEI your behalf, contact them and request the information sighting the above citation. When economic times are tough companies tend to do everything they can to cut costs. Cutting back compliance efforts may seem like an easy cost-saving measure. However, in the long run it may cost you much more than you think. If your senior management thinks they can cut corners in compliance respectfully remind them that fines, penalties and enforcement efforts are on the rise. Subscribe to the International Trade Blog Be among the first to know every time a new article has been posted. It's absolutely free! Join more than 18,950 other exporters who get the latest export news, tips, and insights from export professionals.